That presence is where it all begins. Sure, we can move a body and strengthen muscles…true healing though…that requires a presence and awareness where your client truly feels “seen”, truly feels “heard”. From there assessment takes place and you gain clarity on what is working and what isn’t working. With clarity comes intervention. Our degree of accuracy depends on our presence, awareness and clarity. Here is where the magic really starts to happen. Here is where we help a client reconnect and gain better understanding of their feedback mechanisms. We offer a few different courses depending on what you are wanting to learn. I Love Anatomy: A 4 week intensive online training breaking down 25 of the most commonly taught yoga poses. Understand the mechanics, understand movement. Notice teaching you how to see and feel. 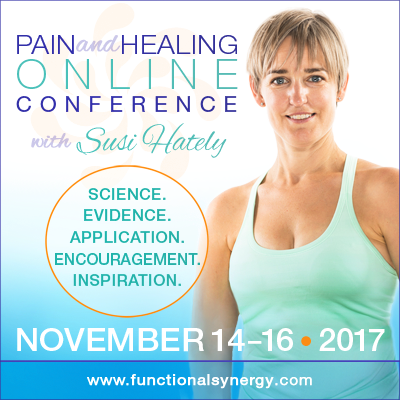 Therapeutic Yoga Intensive: A 6 day live training, plus 3 month online mentoring follow up teaching you the foundational principles Susi has used for over 20 years to successfully help people get out of pain and heal. This will help you how? The key to movement based healing practices is to know what to do when. In order to do this, you need to be able to “see”. You need to be able to “see” who the person is, how they move, what the obstacles to movement are. You need to not see them as a condition. Susi will teach you to see, and your results with your clients will sky rocket. For more details, click here. Evolution: A 10 Week training using Video reviews of your training your clients. I will help you grow your ability to see and further enhance your presence so your results continue to grow. Yoga Therapy Certification. This IAYT Accredited Yoga Therapy program is a 2 year consecutive program which is designed to teach you as you are working with clients. By application only, you can find more details here. “What I love about the training and skills I’ve gained with Susi is now being able to see what is happening when someone moves—how they are compensating, how they are overextending themselves, when they are serving themselves through a movement and when they aren’t. That is what I came for and wanted most, and that is what I’ve gotten and value so highly in helping someone heal without harm. What also came unexpectedly is a heightened ability to see someone as a whole and to be with them in their state while still connecting to my inner self.